Royal Canin Mini Starter 3 Kg Dog Food at lowest price in India. Royal Canin Mini Starter 3 kg is a Mother and Baby Dog dry food and is specifically designed to help small breed dogs stay healthy. Puppies aged up to two months should be fed with meals, which are in our terminology are known as Mini Starter. This meal is essential for the basic growth of the puppy. It is basically given to puppies which weigh from 1-10 Kgs. The Mini starter meal is equally essential for the female dog, at the end of gestation and when they are lactating. 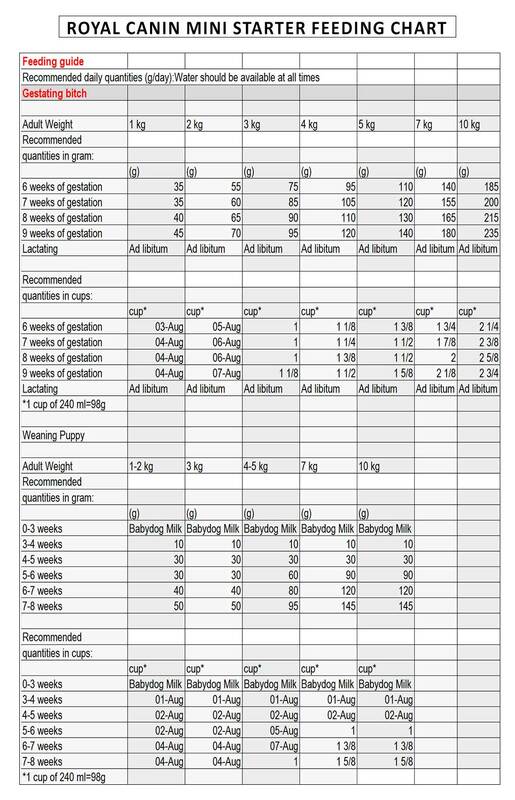 Even after agreeing to the nutrient potential offered by Mini Starter, it is amazing that how the same food can ideally be suitable for both newborn and adult dog. The reality is that Royal Canin Starter food has been inspired by professional birth research programme that meets the nutritional needs of both of the female dogs as well as their newborn puppies. Mini starter is available in 1 kg, 3 kg and 8.5 Kg packets. It has tiny kibbles. If given to pregnant female dogs, then healthy pups are born. Initially, it should be soaked to make gruel at first. When the pups are grown enough, then it can be directly given to them since they are tiny, triangular shaped pieces of kibbles. Overall, mini starter is 100% complete and balanced nutrient solution and its satisfaction is guaranteed by ROYAL CANIN. Nutritional additives: Vitamin D3: 1200 IU, Vitamin A: 13900 IU, E1 (Iron): 47 mg,Beta-carotene: 40 mg, E2 (Iodine): 3.6 mg, E4 (Copper): 8 mg, E6 (Zinc): 201 mg, E5 (Manganese): 61 mg, E8 (Selenium): 0.08 mg - Preservatives - Antioxidants. Protein: 30% - Crude ash: 7.5% - Fat content: 22% - Crude fibres: 1.3%. *L.I.P: protein selected for its very high assimilation. Type: Shower Bath Tool Suitable for both dogs &amp; cats. Fast bathing tool. Stress reducer for anxious pets. Flexible &amp; slim sprayer. Quantity - 100ml Pack - 2 Suitable - Dogs and cats Stimulates the secretion of enzymes in the stomach. Help's in control of gastric infections associated with stomach disorders. Royal Canin Maxi Starter is a complete dog feed for the Maxi breed dogs puppies like the Labrador, Golden retriever, Boxer, German shepherd, chow chow(from 26 to 44 kg).It is given to maxi breed puppies 0 to 3 months old. HEALTHY SKIN AND COAT SHIH TZU ADULT helps support the skin's "barrier" role , keeps skin healthy and nourish the coat. The new Maxi Junior name has been changed to Maxi Puppy. Royal Canin Mini Starter 1 kg is a Mother and Baby Dog dry food and is specifically designed to help small breed dogs stay healthy.